To look for the modules offered in the upcoming semester, you need to make sure that the module list have first been updated for the new semester. If not, you won’t be able to get any results. The International Office of Yonsei will usually email all incoming exchange students when the list is updated. This portal is very useful: you can use it to check the class timings, venue, instructor name, syllabus and even successful mileage points needed to register for the class in the past semesters (If you don’t know what I am talking about, read this first). When you open the portal, you will see the above search mechanism. If you know the module code or title you want to look for, using the search bar on the right side will be easier. Using the search bar will give you all entries from past semesters too so this will be useful if you need to look up for the syllabus for the class before the actual schedule is out. If you want to browse for classes from a particular major in a particular semester, simply use the drop down list on the left side to set your search criteria and the appropriate results will appear. Sadly, Yonsei does not have a system like Nusmods (timetable planner website used by NUS students) which can help you easily plan your timetable so you will need to manually draw out your timetable to ensure that there are no timetable clashes. There is a third party website that may help you do this but it is all in Korean. All examinations in Yonsei is held during class time so as long as your classes do not clash with one another, your exams will not clash too. Again in the portal, you will see the “Room” column next to the “Time” column. Under this Room column, you will see the class’ venue for the semester. The alphabets represents the building’s name (abbreviated) while the numbers represent the room floor and number in the building. 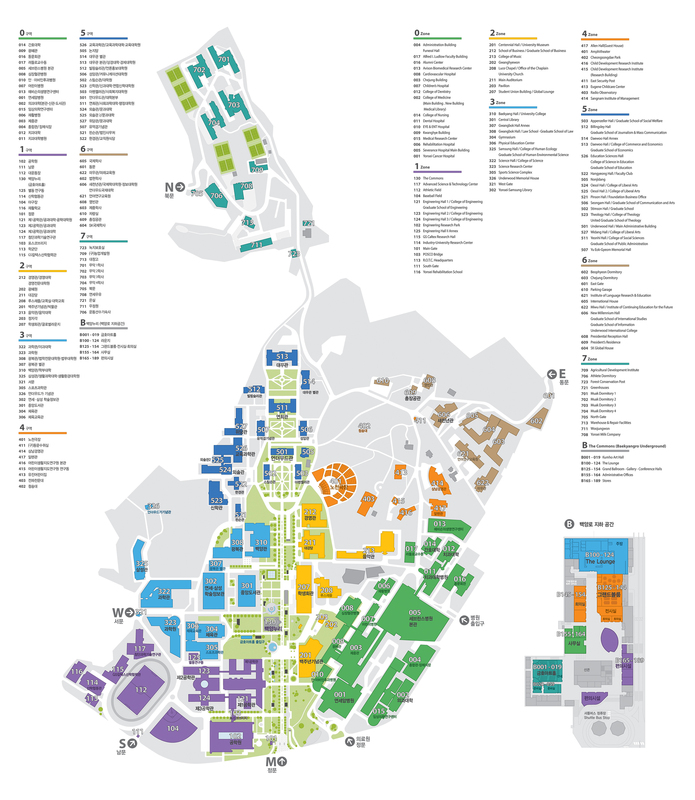 You can use this campus map to check if your venues are close or far from each other especially if you want to have many back-to-back classes. Make sure that all the classes you choose are on the Sinchon campus, not the Wonju or International Campus because exchangers are only allowed to take the classes in Sinchon Campus. In Yonsei, there are some classes organised by the International Division that can only be taken by the exchange students – these modules are coded “IEE”. Other classes coded with other codes like ECO or BIZ mean that you will be taking them with the local students. If you are planning to take a non-IEE class, be sure to check if the class is conducted in English. I guess a benefit from taking an IEE class will be that the professors will be more understanding if you miss class to travel (of course they will also be angry if you never turn up for class though). But generally the non-IEE classes have stricter attendance policies. If you wish to read some business classes in Yonsei during your exchange, there is a special restriction that you will need to take note of when you plan your timetable. You will only be allowed to take a maximum of 3 business courses regardless of whether it is coded as IEE or BIZ. So make sure you account for this restriction when you plan your classes. TIP: some business modules can be found in the Economics department and will be coded ECO. In this case, you can still take the business class coded ECO even if you have 3 other business course coded BIZ and IEE. So make sure to make full use of this if you can! Hope these pointers will help you in your timetable planning! Goodluck!